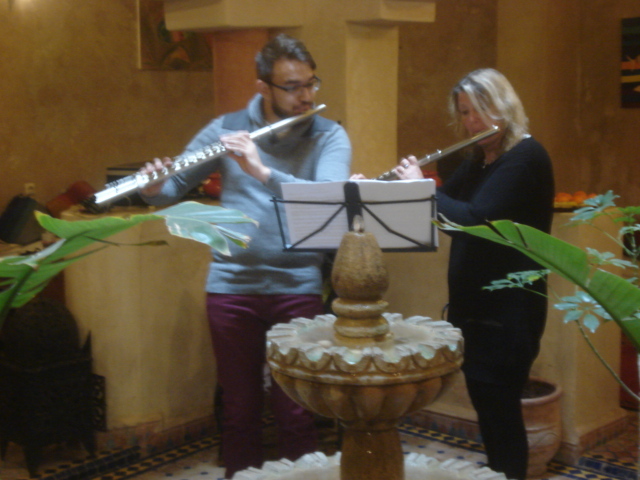 Professional Development – Flutes, Clarinets & Saxophones en Vacances Flute Courses, Clarinet Courses and Saxophone Courses for Adult and Student Flute, Clarinet and Saxophone players. Flute, Clarinet and Saxophone Courses. we suggest that you look at the venues and dates and select a 1 : 1 course or an all levels ensembles and workshop course. Intensive tuition under Nick and Julie’s watchful eyes and “ears”. The repertoire classes will be in a Masterclass situation and the focus will be on you when you are playing solos, but the others may observe, listen and learn from the session. Workshops for Tone,Technique, Playing Tips and Tricks. Suits those seeking personal or professional development or simply a general boost. The accommodation is in a series of 6 adjoining cottages in a rural, lakeside setting. Each cottage has kitchen facilities, living and practice areas and a private patio overlooking the reservoir along with communal lawns. There are Flat screen TV’s with free view and DVD/CD players in each. The cottages vary in size and accommodation but all have been converted and furnished to the same excellent standard which has led to the venue being awarded 4 stars by “Visit Britain”. They all have full Gas Central Heating. Enjoy the local walks, visit the cottage industry chocolatier and the craft drinks shop, plus fabulous afternoon tea cafe. Please select any venue from the links below and we will advise the suitability for your level of professional development. Some courses cover multi instruments and others just single study. Playing levels vary from just a few notes to advanced. We can also visit your School, College or University as Visiting Artists. Julie and Nicholas are a high profile and dynamic team of professional musicians and educators with over 30 years of combined experience. Professional Development opportunities are available on many of their courses, either for first study instrumentalists or for those needing intensive coaching, or rudimentary techniques on flute, clarinet or saxophones as second or third instruments. Benefit from our wide experience teaching beginners, improvers and advanced students, Adults and Teachers. We are happy to share all our knowledge base, tips, tricks and techniques. Plenty of time for those relaxed chats around the table or at the pub too! Please ask and we will create a bespoke programme for you on any course. Other instrumentalists and non players are also welcome to attend our professional development sessions. We host teacher training sessions, seminars and consultations, giving up to the minute advice for instrumental teachers both in private practice or in an educational establishment. In addition to our expertise,we also offer the use of their own musical arrangements – a wide-ranging, inspirational and original catalogue of over 300 titles. Both musicians have a varied performance and teaching career worldwide and use this widely acclaimed experience to help you create, plan, budget for, and structure a musical event or teaching practice/department. From the Beginning or Back to Basics …..
Flute, Clarinet and Saxophone Courses for the non specialist to learn the basic skills or to refresh those fumbling fingers ! Please look at our list of venues and we can create a bespoke programme specifically for your needs. We can go right from the basics and give you a check list of important points for teaching an instrument that is not your speciality…. Suits those teaching multi instruments in a school situation. Hastingleigh, near Ashford, Kent, UK.